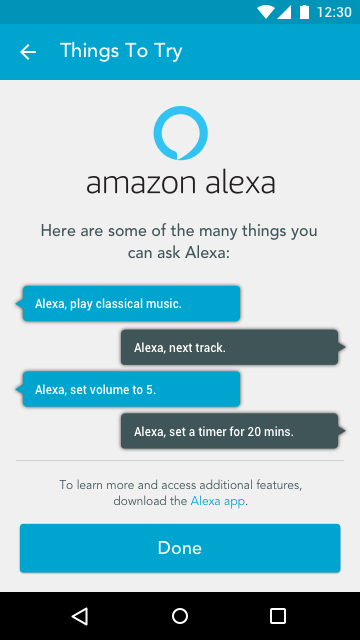 How do I set up Alexa on my Play-Fi System? 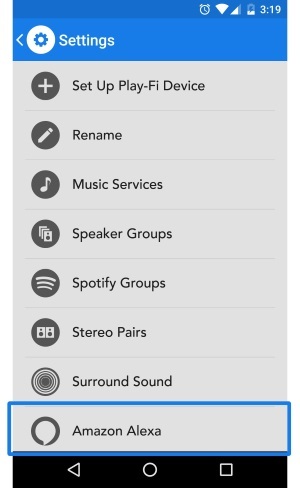 Once you’ve joined your Alexa-enabled Play-Fi product to the network using its branded Play-Fi app, and have gone through all the update procedures, the app should automatically prompt you to link it to your Amazon account, as below. If you don’t see the prompt, or are linking your Amazon account after the fact, you can get to the below screen by going into Settings in the Play-Fi app, and selecting the Amazon Alexa option. Depending on your location, you may be prompted to select your default language for Alexa. Once ready to proceed, Alexa will prompt you for your Amazon account, but if you’ve already used an Amazon sign-on or authentication on your device before, it should automatically apply the credentials for you. If you're linking your Amazon account to a Play-Fi products without microphones, you'll have to ask an Echo, Dot, or similar product to "Discover Devices" so that your new product can be identified. Either way, now you’re all set! Back out or hit the Done button to return to the app as normal, or close it all together and enjoy speaking with Alexa.